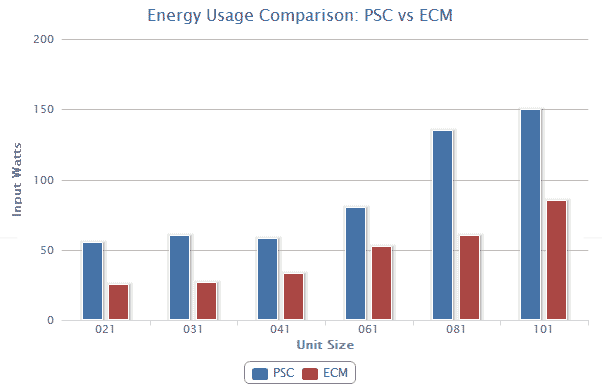 ECM motors are providing a variety of benefits to commercial HVAC systems over traditional PSC motors. These motors are used in pumps, fans, and increasingly in compressors and other motor applications. An ECM pump or fan motor is electrically commutated, which means it uses a DC circuit controlled by an internal microprocessor to vary the speed and torque of the motor to match changing system requirements. PSC motors, or permanent split capacitor, use non-polarized capacitors and brushes to deliver electricity to the rotating parts. These brushes are known to wear out over time. ECM motors do not use brushes, thereby reducing maintenance and extending service life.